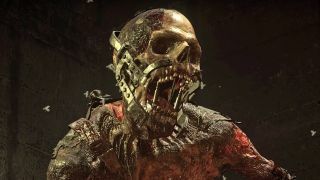 You didn't need a data leak to guess that Call of Duty WW2's Nazi Zombies mode would include microtransactions, but one happened anyway so now we have a pretty good idea of how they'll work. Reddit user that232guy posted a bounty of info from deep inside the guts of the Call of Duty WW2 PC beta, running down what kind of weapons and power-ups will be available in the undead-slaying mode. It's a whole lot of info, so for the purposes of this article I'm going to focus on the loot box stuff specifically. Going by the leak, Call of Duty WW2 will once again let you purchase Zombie Crates; much like in Infinite Warfare, where they included a selection of standard multiplayer items as well as Zombies-exclusive Fate and Fortune cards. Here's the big difference: unlike Fate and Fortune cards, it doesn't look like Nazi Zombies loot will be one-time use. Instead, each drop's rarity level will determine how many times it can be used per match: common cards let you use them once per match while top-tier legendaries can be used up to four times, and so on. According to the leak, you can carry up to two of these items at once in a game. So what can you actually do with these items? The leak laid out six different consumable categories. Discounts: Use one of these to give you a discount on purchasing perks like Schnellblitz, which increases your reload speed. Weapon Guarantees: Sounds like this one will ensure you get a certain kind of weapon from your next Mystery Box pull. Keys: These items help you save cash on opening doors, using mystery boxes, and the like. Power-ups: The good stuff. Activate temporary upgrades to do handy thing like replenish everybody's ammo and equipment or fill up your special meters. Special Weapons: Certain weapons like the Flamethrower and Panzerschreck rocket launcher can only be used for a limited time after you summon them. Good thing you can get Zombies loot with multiple uses per match. Weapons: The leak had less info on this category, but maybe this will be a different kind of loot drop that expands your overall weapon selection? Still waiting on that M1 Garand emblazoned with pot leafs and analog clock hands pointing to 4:20, though. Check out our Call of Duty WW2 info page for more news.